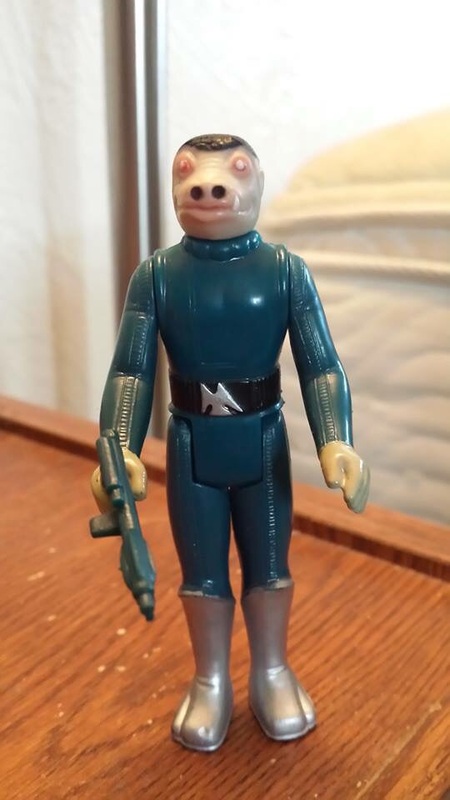 I have a fellow on FB that wants to sell a farmboy Luke with a DT saber, but he doesn't know if it's absolutely real. He sent me pictures, and says the handle reads "EE" or "LE", he's not 100% sure. 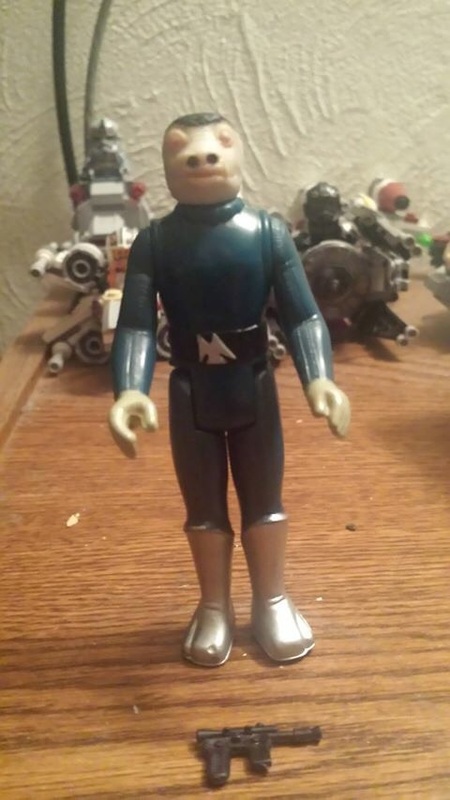 He bought a Star Wars mini-action figure case at a yard sale (filled with near mint figures including blue Snag). He doesn't collect vintage, and just wants to sell. I helped him research prices on eBay, and it looks like it could sell for around $550-600 easy....if it's real. I posted pictures in the TIG FB page if you'd like to let me know what you think. Hi, is this the only picture? Wow, your a new user and you can post photos? Mods make a note that maybe the forum restriction isn't in all sections. This is not a bad thing towards you chuck, just that everytime someone comes and wants to post pics they can't because there is a restriction of 10 days or something like that. On to the Luke. The saber is either not extended fully or is broken short as the inner should be longer than is seen in the photos. Can't really see the lettering on the saber, but more pics would for sure help. Need one taken straight on from the rear also. This should show the inner inside of the outer for the rear so we can see the oval shape of the outer. Also pics from the top to see if there are any mold tree break points that may line up with known examples. As of right now nothing screams fake, but without more pictures there is no way to be 100 percent certain. One of the best guys to ask on dt sabers is Bill McBride. A few of guys on the board can make our best educated guess, but I would defer to Bill as he has exponentially more experience with these than me. Thanks, Bryan. I thought about messaging Bill. I know he focuses on Vader, but wasn't sure about DTs as much. I'll ask the seller if he can get a few top view and rear view shots. He's blown away that he has it. He knew the Luke looked nice, and was ready to sell it in a lot. I told him I thought it was DT based on a crappy photo, and sure enough, he sent me these to help him confirm. I helped him research to make sure he wasn't getting taken by anyone. He couldn't believe his luck when I told him what he had. The blue Snaggletooth is impressive, too. The Ben and Vader are near dead mint, but both have regular sabers. I'll see if I can post the blue Snag pic, too. Did he have multiple blue snags? These two don't seem the same? The wear at the top of the left leg boot doesn't look the same in both pics. Possible lighting issue, but I can see blue on the second pic on the top ridge and the first pic looks like the silver is still there. Edit*looking at the photos again I think the lighting in the first pic is what is causing the confusion. Really poorly lit photo. This is in really nice shape. 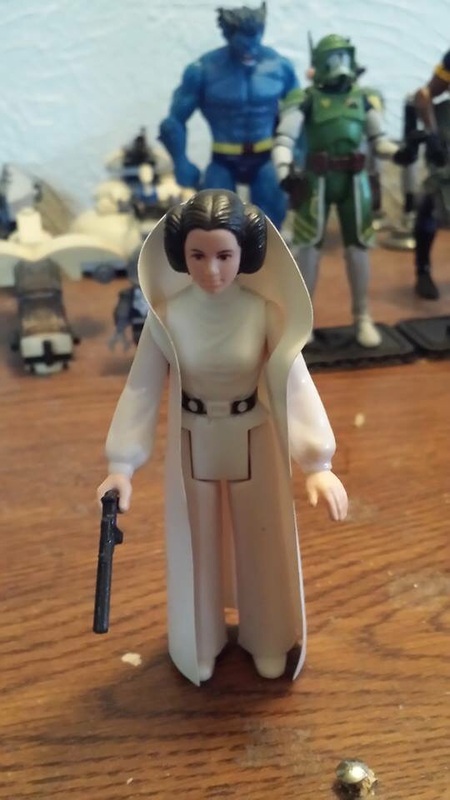 You know the imperial/stormtrooper blaster is incorrect for this figure. The blaster from the first photo looks correct. If memory serves should be the black not blue black weapon. But it has been a while so you might have to recheck that. Yeah, same Snag. He sent the pic with the Imperial blaster first. I told him it needed a dark blue almost black Han pistol and he shot a new pic. I think he wants $650 for the pair, but is waiting to confirm the authenticity of the saber first. He doesn't want to sell something falsely. Look at this Leia he has, too. I haven't kept up with current market on these, but the way things are going I would bet the pair at that price is a heck of a deal (if the saber is authentic). Basically the blue snag for free or close to free. Bill is on here under his sithtoys id. Might shoot him a pm. He doesn't log into TIG as much as other forums, but he should have his email on the contact page or a pm will send an alert to his email anyway. Another guy to ask is Jay (psybertech) as he has a Luke farmboy focus and studied up on the Luke dt pretty good. I know some and have one, but am not all that great. A large amount will depend on the photos and the clarity. They need to be clear, and well lit as well as sharp details like the better pic of the snaggletooth. Also if the saber is out of the arm or back I. The arm or whatever, tell the guy to leave it as is if possible. The Luke sabers are t as brittle as the vader or Ben, but a lot of dt sabers have been snapped by just putting them back in or taking them out of the arm slot. Looks like he found a good minty lot. She is beginning to turn pink on the legs it looks like, but that is plastic degradation and not much can be done about that. that blue snag is in really good shape . hope all this works out for you .